Backstage Lord Randolph was attacked by Rain and forced off the card due to injury. Since he was set to defend the title against Dellico later in the night in a Ladder Match, he was forced to relinquish the title to Dellico. 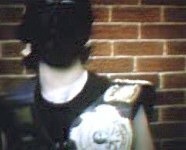 Law and Order successfully defended their Tag Team Titles against the team of Pimpin Paul and the Arabian Rainman, after Rainman accidentally hit his own partner with the ceiling tile. Angelica Acid was proclaimed the Women's Champion by Pretty Boy, since she had lost the World Title to a male and not a female. Then her opponent was brought to the ring. 'Cunning' Christine. 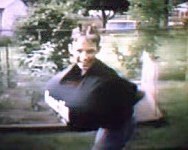 Yup, you guessed it, 'Cunning' Chris in drag, equipped with Basketball Breasts. This was Angelica Acid's one and only title defense. Read on for more info. Lazaroth def. Victor Vain once again, this time in a Lights-Out Match. If your opponent cannot answer the ten count, then you win. This would be Victor Vain's last match. The next match was a return match from Redemption '98. It was to be Scott Thunder vs. Stratus w/ special guest referee Pretty Boy. As per stipulation this would be a submission match, with Pretty Boy right there to hear those words... "I quit." The match went for a good 20 minutes in one of the most grueling matches of the year, and concluded when Pretty Boy called for the bell claiming that he heard Thunder submit. It should be noted however that at that point in the match Thunder had been knocked unconscious via a board to the head from Pretty Boy. Therefore he never ever submitted. Pretty Boy vs. Mr. Malicious for the World Championship. Best 2/3 Falls match. Pretty Boy got the first fall by superkick. Mr. Malicious came back and got the next two. Finishing Pretty Boy off after throwing him through a board propped up against the fence.